Don't be under the assumption that because this isn't from a big name publisher it's not worth getting. Robin can show the big name photographers a thing or two when to comes to clear and concise explanation. Couple that with excellent photography and some inspirational thoughts and you have a steal at the current kindle price. No hesitation in recommending this or any of the other books in Robin's series. Which filter is it best to use? Is there a particular order I need to use the filters in? Where in my workflow should I use each filter? There are multiple filters to achieve the look I want. Which is the best choice? I have large sets of images that I need to process quickly. Is there any way to automate this? What is a good workflow to follow? The different options and combinations are staggering. What this book provides are answer to these questions and others you may have. You will learn how to work effectively and efficiently with the Nik Collection filters. You will learn how you can integrate these into your workflow to achieve processing results of the highest standard. In short it will cut through all the confusion to help you produce great results. The book is divided into two parts. Part one examines the options for working with the different filters and helps you to develop your own workflow. The second is a series of 5 examples where the entire workflow is demonstrated. These examples are supported by image files that can be downloaded from my website allowing you follow along and gain more from the book. Important - The examples in this book assume you are familiar with the operation of the Nik Collection filters. Whilst the examples are comprehensive and explain many of the features used, they do not provide a complete explanation of how to use the filters. If you are unsure as to how to use the filters, please refer to my other books which cover the individual filters in depth. For those of you who already know how to use Nik filters, you will find this book is packed with useful information and tips, including examples employing techniques in Photoshop and Elements to enhance the results. At over 26,000 words in length and with more than 140 colour (and some black and white) illustrations this is a great addition to your image editing library. 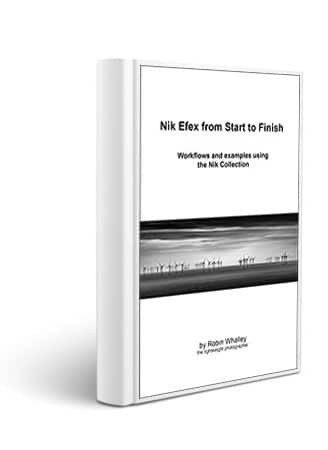 If you work with the Nik Collection filters but find you restrict your efforts to just one or two filters, this is the book you need today. Stop limiting your results and realise the investment you have made in these great tools.